Domo – the Utah-based company that has raised more than a half-billion dollars since being founded six years ago – this week is unveiling broad new capabilities for its business analytics cloud computing platform. Domo, which we identified as a Cloud Company to Watch back in 2012, is software as a service that aims to democratize data analytics for everyone in a company, from C-level executives to employees executing day-to-day work, says Matt Belkin, Domo's chief analytics officer. This week at its annual user conference named Domopalooza, the company is unveiling a new app store and partner platform, new social collaboration tools, expanded mobile support and a freemium version of the product. At its heart Domo is a business analytics SaaS tool and advanced visualization dashboard. The system ingests data from a variety of sources, including ERP, CRM, digital marketing, analytics and finance programs that a business already uses. Belkin says Domo has built 1,000 data connections with various software platforms and 400 data connectors. 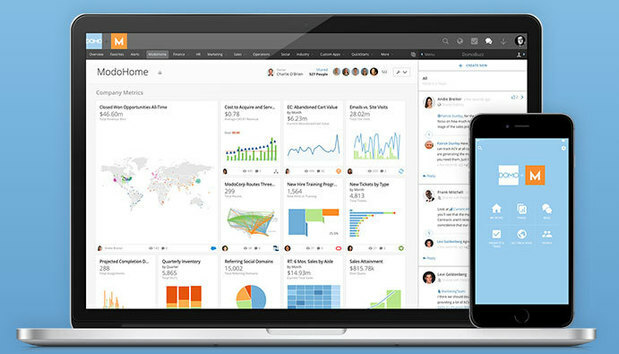 Domo takes those thousands of data sources and creates customizable visualizations for users. As part of a new Appstore that Domo announced today, there are hundreds of applications that users can link into their Domo account. The Social Index app analyzes your presence on various social media platforms, while the Mobile App Performance tool provides information to marketers on the success of a mobile application in terms of engagement and adoption. There’s a new sales forecasting app, plus travel expense management analysis features. Another app allows a CIO to keep track of popular phishing attacks and monitor for them in their environment. Domo also released Buzz, a collaboration platform that allows data analytics and visualizations to be incorporated into the messaging platform. Domo began selling its product generally in April 2015, although it’s been in the market since 2012. This week it introduced a freemium model, which includes Buzz and other basic functions of the app free, with more administrative controls costing extra. Domo’s paid version starts at $95 per user per month, and ranges to $250 per user per month for the enterprise package, which requires a $50,000 platform fee too. There could be additional data storage costs on some plans. More pricing information can be found here. Domo has closed another $131 million in funding to bring its total to $590 million at a $2 billion valuation (startups valued at more than $1 billion are referred to as “unicorns”). Domo competes with publicly-traded Tableau Software, among others. Investors include Benchmark, BlackRock, Fidelity Investments, GGV Capital, Greylock Partners, IVP, Salesforce.com, TGP Growth, T. Rowe Price and Zetta Venture Partners. Domo says its product is already on a $100 million run rate. Domo’s CEO is Josh James, whose previous startup -- Omniture -- was purchased by Adobe for $1.8 billion in 2009 and became the company’s Marketing Cloud. « Will Apple ever release a Mac hybrid?